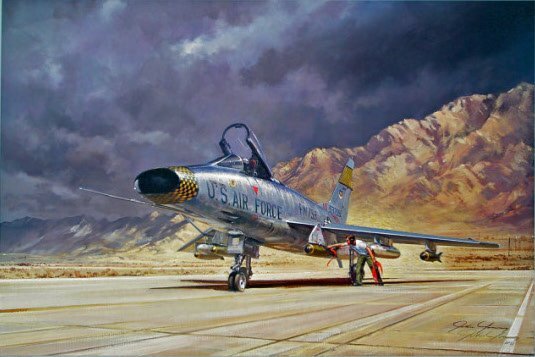 Paper Size: 26.75" x 20"
As menacing thunder clouds retreat beyond thrills, a USAF F-100D readies for a practice bombing mission from Nellis Air Force Base to one of the nearby ranges. North American's Super Sabre, first of the Century Series fighters and the USAF's first true supersonic fighter, began operational service in 1954. Progressing in models "A" through "D", the F-100 continued to fly through the late '60s and was used effectively in ground support and "Wild Weasel" roles in Vietnam.